First of all, I would like to say happy Father’s Day to my Dad! I don’t think he will be reading this online but maybe someone (Kathy, Pauline, I’m talking to you!) will print it out and show it to him. This Web site would not be in existence if it weren’t for my Dad’s influence on my cooking. My willingness (and sometimes compulsion) to experiment with food is definitely something I get from my Dad and if it weren’t for that, I wouldn’t have started creating my own recipes. I am extremely lucky to have come from a family where both parents were great in the kitchen! Happy Father’s Day, Dad! I love you! I recently received the latest issue of Cook’s Illustrated in the mail and was very happy to find a section dedicated to creating restaurant-style Greek gyros at home. A few days ago, we tried the Cook’s Illustrated version of gyros, which were miniature pan-fried ground lamb or beef patties flavored with onion, garlic, and oregano among other things. Those little patties, while strange looking, were actually very good wrapped in pita with lettuce, tomato and tzatziki. They may not have looked like the stuff that gets cut off a vertical rotisserie at your favorite Greek fast food place, but the flavor and texture were pretty close! But my favorite part of that meal was definitely the tzatziki. After I finished my pita, I stood over the bowl eating spoonfuls of tzatziki until it was gone. I’ve always loved it but for some reason had never made it at home. Well, I just made it again and this time I’m gonna share it with you! Here’s the original recipe from Cook’s Illustrated (July & August 2007) followed by my own comments and changes. Line fine-mesh strainer set over deep container or bowl with 3 paper coffee filters or triple layer of paper towels. Spoon yogurt into lined strainer, cover, and refrigerate for 30 minutes. Meanwhile, combine cucumber, 1/8 t. salt, and lemon juice in colander set over bowl and let stand 30 minutes. Discard drained liquid from yogurt. Combine thickened yogurt, drained cucumber, remaining 1/4 t. salt, garlic, and mint in clean bowl. The first time I made this, I didn’t bother salting and draining the cucumber and it turned out just fine. I did squeeze the chopped cucumber in a wad of paper towels to get some of the moisture out and then I just added the cucumbers and all the salt to the mixture at once as well as the lemon juice. I do suggest taking the time to drain the yogurt unless you can get thick Greek-style yogurt. If you want to double the recipe, try using a double thickness of cheesecloth to line the strainer rather than coffee filters when you drain the yogurt; the coffee filters just aren’t big enough. In fact, I always use cheesecloth when I strain yogurt. The first time I made this, I didn’t have any fresh mint. I actually killed my mint plant. I’m not sure how I did that because I thought it was nearly impossible to kill it. But I did. So, I used dried mint. Now, the Cook’s Illustrated people say not to use dried mint but Nicole says that dried mint works just fine as long as it’s not 10 years old or something. I thought it was a really good substitute, actually. In today’s version I used a combination of fresh mint (I got a new plant and I plan on watering it this time) and dried dill (I would have used fresh but didn’t have any). That was good. I also added some cayenne pepper. That was also good. I think that tzatziki is usually flavored with a bit of vinegar but I liked the lemon juice and haven’t tried it with vinegar yet. You can also serve it drizzled with olive oil. This recipe is really flexible so you should experiment and make it your own. If you’re a garlic lover, add more! If you hate garlic, leave it out completely. You could substitute some onion for the garlic or use both. I don’t care what you do, just make some of this soon! It’s a perfect summer snack! Oh, and I happened to make fresh pita to accompany my tzatziki this time. If you have never made pita at home, you should definitely try it! It’s easier than you might imagine and once you taste it, you’ll never want to eat store-bought pita again! I’ll share my recipe soon! This week’s edition of WHB will be hosted by Rachel of Rachel’s Bite, so be sure to head over there and check out the other entries! If you don’t know what I’m talking about when I say Weekend Herb Blogging, head over to Kalyn’s Kitchen to read more about it! Hooray, I love Greek food. In fact, in Chicago there's a wonderful restaurant called Greek Islands we might want to go to. 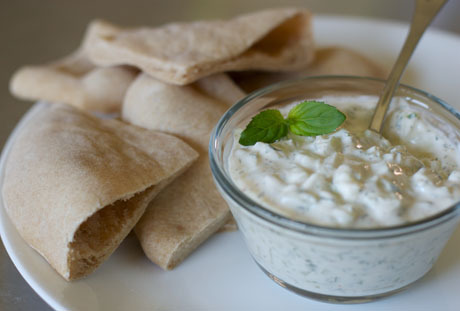 I haven't made tzatziki, but have been thinking I should try making my own, since I love it so much. It's great on grilled salmon. Your recipe looks perfect. So that's what the gyro sauce is called. I could never remember the name, but I do recall asking for more at many different restaurants. "Can I get more of that white gyro sauce stuff?" I would ask."Tzatsiki? Sure, I'll be right back" the server would reply.Minutes later, the word was already forgotten. Not the taste though. I love tzatsiki. I used to put it on everything including pizza. I'm weird that way. Glad to find you in your new diggs. Is the grass greener here? If nothing else the sauce is creamier. Nicole,The new site looks great and from a Greek, you're Tzatziki's lookin' fine! This is the third time within a week that I am seeing a recipe for Tzatziki and I can't wait to try it. Your pita bread looks so yummy. Haha, I'm with Jason on this one. I usually ask for more yummy sauce. I'm the sort of person that drowns my food in sauce. It drizzles all over my plate, often times down my chin and on to my shirt! Nicole, this actually happens to you quite a bit! hehe Thanks for providing the recipe, as the barometer reaches into the 100's here in Central California, I tend to look for recipes like this, cool yummy and refreshing! Kalyn: You should definitely try making it! And I would love to check out that restaurant!Jason: Well, now you know. And now you have a recipe. When I'm home we can try making the gyros I was talking about.Jonathan: Hmmm...I'm thinking about making some kind of spicy pizza this week. Maybe I'll serve it up with a side of tzatziki! You're more than welcome to stop by!Sandi: Actually, I would say that the grass is greener here! I had a really good experience with wordpress.com but it's so nice having my own little place on the web :-)Peter: Thanks so much for the compliment! Sorry I haven't been in touch, I'm off to check out your site now!Cynthia: Well, it's definitely the right time of year for this type of food! I'll have to get out and see who else is blogging about tzatziki :-)Ruby: Thanks so much for telling the world that I have a problem with spilling my food (and beverages) all over myself! Hahaha! At least I'm not the only one ;-) And yes, I remember your obsession with sauces (particularly taco bell sauce)! Mmmm...I love Tzatziki....and I love lamb gyros!!! Never heard of tzatsiki, but had Greek food once in Eugune , OR down town. It was long back. I guess even the Mediterranean Restaurant has something ( yougurt sauce) similar in the menu served as a side with pita. Nicole, I love tzatziki smothered all over my falafel! Yum. I've never actually added the mint to it, but have quite a bit in my garden and will have to next time I make it. Love your site's new home, it looks wonderful! Shea: I was never a very big fan of lamb until this year. But I've really been enjoying it lately!Padmaja: The first time I had Greek food was at a restaurant in downtown Eugene! I can't remember the name of the place :-)Jen: Mmmmm...it's been so long since I've had falafel! I should try making it myself. i love your website. i'm looking forward to your pita recipe!! My fiancee and I absolutely love lamb and gyros, but we always have to order it at restaurants because we can't quite get it right at home without the rotating spit fire. Do you have any versions of the cook's illustrated recipe? I Love tzatziki sauce and greek yogurt. I use non-fat greek yogurt with everything, including as a replacement for sour cream, sweetened with cinnamon for pancakes and of course on top of falafels and gyros! Yum! I have made this and it is great!